Coincidence? Who knows. Yesterday I put on a MP3 compilation cd and what came out? 'Take time to know her' and 'My special prayer'. I hadn't heard the two songs in ages and what I found is that 'My special prayer' is a beautiful, yes and terribly tacky, song. A huge, huge hit in 1969 in NL. 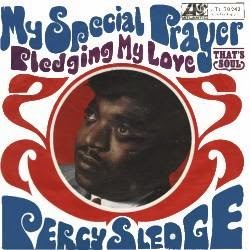 One in a serie of 5 or 6 I think, after which Percy Sledge went back into no-hit obscurity, but with a few songs to his name that will last forever. The only memorable fact I have of Percy Sledge is that in 1968 I was looking with my cousin at the Veronica Top 40 and decided to pronounce all songs as they would be pronounced if it was Dutch that was written in the charts. (Most songs were and are English in NL charts.) No other song sounded better than 'Take time to know her'. Pronounce that in a fast way with a Dutch intonation and you'll know what I mean. If you can that is. That probably being the only reason why I remember the event, because it sounded so funny.